"It wouldn't be Christmas without one (or several!). If you have a home espresso machine, this is a great holiday coffee treat." Pour milk and eggnog into a steaming pitcher and heat to between 145 degrees F to 165 degrees F (65 to 70 degrees C) using the steaming wand. Brew the shot of espresso, then add to mug. Pour the steamed milk and eggnog into the mug, using a spoon to hold back the foam. Spoon foam over the top. 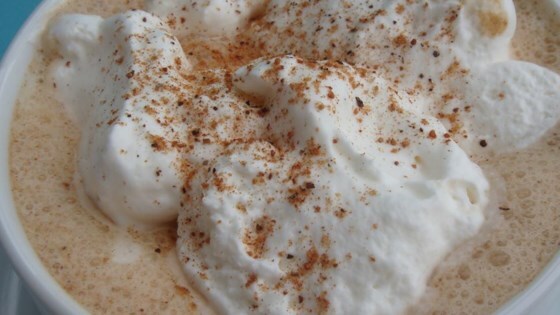 Sprinkle nutmeg on top of the foam. Okay. Not great. You can taste the eggnog, but it's not knock-down awesome. I found eggnog at Walmart! So I decided to try this recipe out! It turned out really well! I love this so much! I was out playing in the snow and I came in and had this! It was like a warm hug on a cold day! (like the hot chocolate container said)! THANX! This is the same ratio I use when making my Eggnog Lattes. I use skim milk and the lowest fat eggnog I can find. Yummy! Can't wait for eggnog to be on the store shelves. Great recipe - great tasting and now a part of my Holiday routine!